Roasted tomato lends itself to many uses – the base of a soup, roasted tomato pesto, or just as-is for a sandwhich topping. Roasting concentrates the tomato flavors, redeeming even the most lacklustre fruit from a state of blandness to delighful tomato goodness. For this recipe, we used an assortment of heirloom tomatoes from the backyard garden. Roasted Tomatoes with Olive Oil and Garlic. 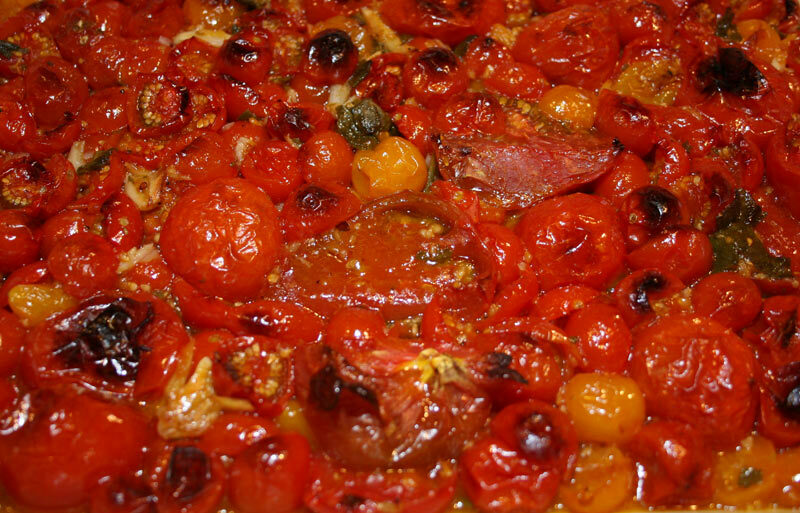 Most of the effort in roasting tomatoes is used in the prepping of the fruit. If you’ve ever made peach preserves, you’ll recognize the steps as the same ones used to prepare peaches. Bring a large pot of water to boil over medium heat. Using a sharp knife, make an “X” at the bottom of the tomato. Try to make the “X” only skin deep. Using a slotted spoon, place the tomatoes in the pot for about 10 seconds. Remove and cool. The skin will begin to lift and can now be easily removed. Preheat oven to 350F. Cut tomatoes in 1/2 and place in large roasting pan/sheet. If a baking sheet is used, you’ll want to use one with a side to contain the copious juices that will be generated. Add garlic, coarsly chopped basil and oregano and onions. Season with salt and pepper and add olive oil. Mix all the ingredients and bake in oven for about 40 minutes. The tomatoes will have reduced significantly in size and, depending on the type of fruit used, the pan might have quite a bit of juice at the bottom. (Do not discard). Remove from oven and allow to cool. You now have a base ingredient for many great dishes. Soup, pasta sauces, pesto etc. Well that was easy, and it taste really good. Can’t wait to see some sandwiches to use this one, but for now it goes on my pasta !